Surprise, Microsoft's quietly updated Games For Windows Live to version 3.0 and added scads of new features to tickle your facet-fetish. For starters, there's now an in-game marketplace ("the biggest feature," according to the intro page) designed to facilitate buying items from, you guessed it, within the games themselves. No more exiting a game to peruse or procure downloadable add-on content, now you simply invoke the GFW Live interface, click the content you're after, and bombs away. Actually bomb's the wrong metaphor. More like borg's. Using technology I wasn't aware existed, said downloadable content gets slipstreamed into the game as you play. No need to exit the game and restart. Hey, not too shabby! Also more tinker-friendly: You can fiddle your account settings, redeem purchase codes, change your Gamertag, and add Microsoft Points, all without leaving the game. 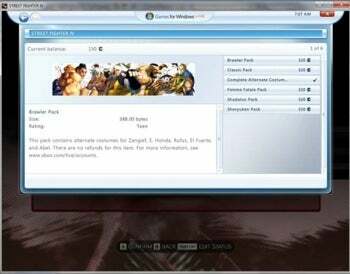 Buying the "Brawler Pack" from within Street Fighter IV. Server Side Authentication links the game license to your Gamertag. The advantage of this method is that it allows installation of the game onto any PC, anywhere — only you can access the LIVE service from the game. Server Side Authentication has no affect on offline play. Translation: You know how you can drag your Xbox LIVE id around, but can't have it running in more than one memory space, e.g. a discrete memory unit or hard drive? Like that, but fingerprinted against your game content, i.e. "download many, play discretely." You could, of course, theoretically "lend" your id to a friend (say you're out of the country or traveling for six months) but while they're using it, you won't be able to. Zero Day Piracy Protection keeps games from launching before the street date the publisher has set for the game. 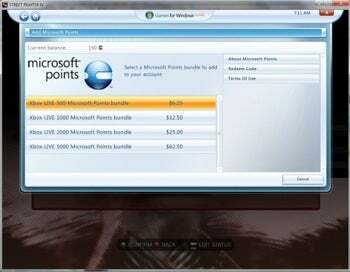 Snagging some Microsoft Points from within Street Fighter IV. The installer looks to be about 24.8 MB. I'm running Windows RC1, and the update seems to be running fine. For some reason it takes awhile to come up though. I'm on a 20MB broadband connection, but it took in excess of 20 seconds (after signing in) for the main interface to load. (Curse your eyes Adobe Flash?) I'm also not remembering the Microsoft ad center flashing banner commercials from the bottom of the interface, but maybe it's been there all along. I use GFW Live so rarely, it's easy to forget. Why rarely? Because for reasons Microsoft's never explained, the flow of GFW Live games on a monthly/annual basis is like water from a desert well. To date in 2009, we've seen five, with less than a handful to come. To put that in context, the skinny two-page GFW Live game-browser list is still dominated by stuff like Shadowrun, Halo 2, Gears of War (the original), Kane & Lynch, and Universe at War. Oh boy! The new features are welcome, to be sure, but if Microsoft wants to sell the service to gamers (media notwithstanding) it needs to establish a policy whereby anything under the GFW moniker is likewise LIVE-enabled. Pick a date, Microsoft. Draw a line. Whatever it takes to incentivize developers. Have a look at all the GFW-branded (but not LIVE enabled) games that are multi-platform PC/console stuff with full Xbox LIVE support. Why in the world would you release a LIVE-enabled version of a game for the Xbox 360, then fail to support the feature in the frequently lag-released Windows version?